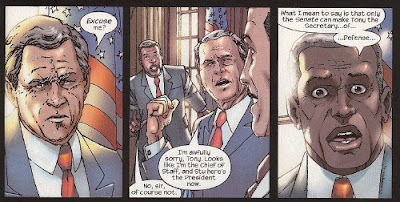 The Marvel Universe is treated as our universe, for purposes of who major public figures are: George W. Bush had a significant role in several of my issues of Iron Man (including #74, below). As Marvel is announcing with a bit of a press wave, his soon-to-be successor Barack Obama makes his in-universe debut in Amazing Spider-Man later this month. This has been the case with Marvel for a long time — going beyond using real New York rather than fictional Metropolis. Ronald Reagan was transformed into a reptilian creature in Captain America. And who can forget Jimmy Carter in a 1980 X-Men, nervously talking to "Dr. Coahbeau" about the Phoenix Force? I'm trying to remember whether Gerald Ford was in any contemporaneous Marvel comics. Although since his veep Nelson Rockefeller was possessed by the Serpent Crown in Avengers, perhaps that would have been an honor better avoided! I discussed the use of public figures — and the politics involved — in several of the production notes for that run; see the individual issues. In general, I angled to make the position of public figures essentially neutral, but open to interpretation; you could alternately see Bush's appointment of Tony Stark as brilliant or reckless, depending on your point of view. The more detailed discussions of the politics involved came from fictitious chief of staff and press secretary. Edit: I've since turned up Ford in Howard the Duck and Fantastic Four.